Soprano Elena Kelessidi was born in Kazakhstan of Greek parentage. She studied at the conservatory in Alma-Ata before moving to Greece where she made her debut. She appeared at the Megaron Hall Athens as Donna Anna DON GIOVANNI, which brought her to the attention of the Royal Opera Covent Garden. 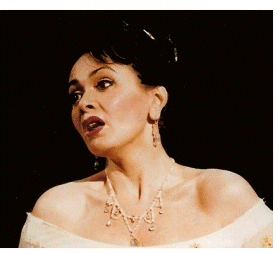 She made her Covent Garden debut as Violetta LA TRAVIATA since when her international career has continued to flourish taking her to the principal opera houses of the world. Maurizio Benini; Richard Bradshaw; Bruno Campanella; Riccardo Chailly; Placido Domingo; Vladimir Fedoseyev; Adam Fischer; Lukas Karytinos; Kent Nagano; Kiril Petrenko; Stewart Robertson; Julius Rudel; Marcello Viotti; Simone Young. CD of Russian songs entitled ELENA KELESSIDI A RUSSIAN ROMANCE accompanied by Malcolm Martineau, issued by Onyx Classics.